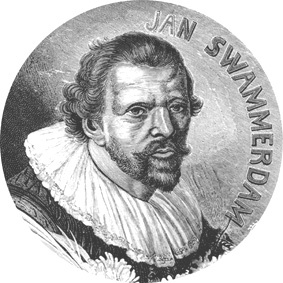 Jan Swammerdam, a 17th century Dutch microscopist, made major discoveries in medicine and anatomy. Above all, he made a decisive contribution to the development of biology and a materialist understanding of nature. His greatest contribution to biology was his understanding of insect development and his demonstration that the same organism persists through its various stages. Using meticulous dissections and careful experimentation, he showed the errors of spontaneous generation and laid the basis of the modern understanding of development. His science was profoundly marked by his mystical and emotional response to nature, which sometimes entered into contradiction with his avowed experimental philosophy and even led him to abandon science for a period. It has also been argued that this led him to put forward the idea of preformationism". This site contains information relating to his life and work. The picture above left is NOT Jan Swammerdam. Click here for a full explanation. For more information about Swammerdam, read The Egg & Sperm Race by Matthew Cobb (published in the US as Generation). Also available in Dutch and Turkish translations. See also the website that accompanies the book. This site is maintained by Matthew Cobb. For more information about the site's author and his day job, click here.